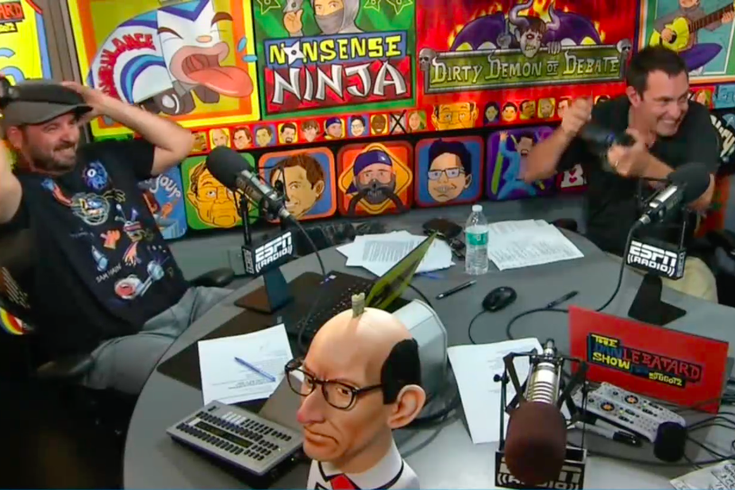 Dan LeBatard, left, and co-host Stugotz during Tuesday morning's show on ESPN Radio. Miami-based radio host, TV personality and columnist Dan LeBatard has never been shy about criticizing the company for which he works, ESPN. His morning show cohost, Stugotz, has never been shy about criticizing anyone, for any reason, at any time. He's a special creature with few morals, even less shame, and an opinion on everything, most of which are either stolen takes or lies he's fabricated to make himself look better. On Tuesday morning, The 'Gotz – that's his on-air persona; in real life he goes by Jon Weiner – took a flamethrower to two former ESPN colleagues, Colin Cowherd and Jason Whitlock, both of whom now work for FS1 after spending time at the Worldwide Leader. And, with LeBatard leaning back from the microphone and giggling as his co-host goes scorched earth on two people he's referred to as "friends" over the years, Stugotz did so in a way only he can. • Cowherd: He recently said during an interview with a Cleveland radio station that the massive layoffs at ESPN late last month won't be the end of their housecleaning. Furthermore, he said that he saw it coming. • Whitlock: He wrote a Sunday column for the Wall Street Journal that suggested ESPN's shift to a more liberal ideology is the direct result of negative coverage from Deadspin. And that's what caused Stugotz, a man referred to by LeBatard as "an out of control sprinkler spewing nothing but hot takes" to lose it. “I really don’t care what Jason Whitlock and Colin Cowherd have to say about ESPN, after leaving ESPN,” Stugotz said. “I don’t care. The audacity of Colin Cowherd to tell everyone that he knew that this day — the bad week that ESPN had recently — he knew it was coming, and knew it was coming years ago. Colin Cowherd — get over yourself man. I don’t even know where you are. I don’t know where to find you. I have no idea. “And Jason Whitlock — shame on you, writing articles. You had a big opportunity here. You know who blew it? You did, Whitlock. And now you’re somewhere where I can’t find you. I can find both of you on Twitter. But here’s the thing with both these guys. I’m really not interested in what anyone who was with ESPN has to say about ESPN right now. I don’t care. Colin Cowherd predicted this? He told his staff when ESPN signed its recent NBA deal that ESPN is done? Guess who’s not done, Colin Colin Cowherd. ESPN. Guess who’s not done? This radio show. Guess who’s just getting started? Us. Guess who is done? You are. You are finished. Enjoyed the segment, Stugotz. But we've never discussed Cowherd. I make my dislikes very public. I don't tell secrets. I have none. I didn't like Cowherd's take on John Wall. I've been appearing on Cowherd's radio show for years. Wait, you're saying he distorted the truth to benefit his argument? Please don't ever change, Stu.